Transformers are used for transferring power from high voltage side to low voltage side or from low voltage side to high voltage side. Distribution lines are used for distributing the power from substation to load centers. For better understanding, we will first discuss the functioning of important elements of a large electrical system. In this article we will discuss about synchronous generator. In any large electrical power system, the generation of electricity is of primary concern. Firstly here we will talk about AC generators only. The large generators in the power station are also called alternator or synchronous generator . We will mainly use the term generator or synchronous generator . Large generators in power station are driven by turbines, usually a turbogenerator or hydrogenerator. Whatever the name, here generator always means the AC machine in power plants for producing bulk quantity of power. The generators are basically of two types in design. The generators which are high speed types and having two or four poles. This type of generator is long and the diameter is small.This generator is driven by high speed steam turbines, used in thermal power stations. The axis of machine is horizontal. The other is slow speed type. The slow speed type may be having 8, 10 or more poles. The poles are of salient pole types. This machine is short in length and having large diameter. This slow speed generator is used in hydro power stations where usaully slow speed turbines are used. The axis is vertical. and turbine is placed below the generator. Both types of generators sketch are shown in the figures below. 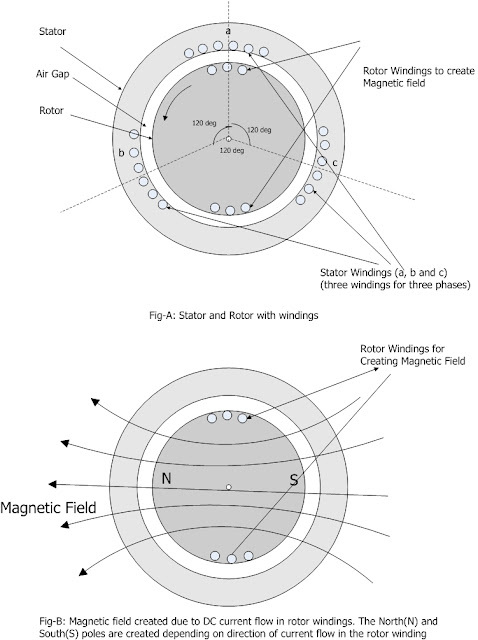 In the figure also the sketch of magnetic field due to current in field windings is shown. It is to be noted that the very basic principles for both types of generators are the same. The generator is basically having two parts, Stator and Rotor. The stationary part is called Stator and the moving part Rotor. A sketch of generator is shown. Both Rotor and stator are having windings. The field winding is wound in the rotor which is supplied with direct current. The DC currect circulating in the field winding generates a magnetic field. When the Rotor is rotated with the help of turbine so do the magnetic field. Now the winding wound in the stator links the rotating magnetic field and emf or voltage is generated across the winding. Let us consider a 2-pole(one Noth pole and one south pole) machine as shown (Fig-A) above for turbogenerator. 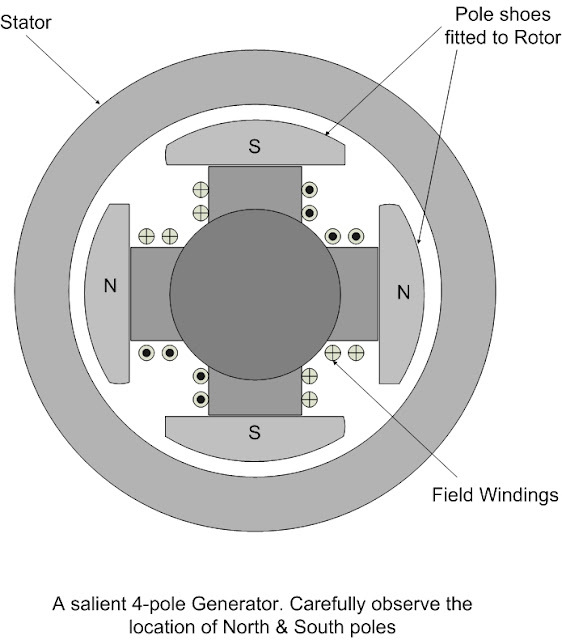 In actual generator there are three sets of windings wound across the periphery of stator. They are placed 120 degree apart. Hence as the rotor is rotated so the rotor magnetic field rotates and crosses the stator windings one by one after each 120 degrees rotation. Suppose the two ends of winding "a" are marked a and a'. When the winding is under north pole if direction of induced voltage in winding "a" is from a to a' then when the rotor rotates 180 degree the winding comes under the south pole and the direction of induced voltage is reversed that is from a' to a. This change is not abrupt but gradual and sinusoidal as shown below. In the figure, just observe that at 180 degree the voltage is zero. after further rotation the winding comes under the next pole, and the direction of voltage is reversed. This voltage magnitude increases and becomes -V and then further becomes zero at 360 degree. Now the voltage wave completed a full cycle. 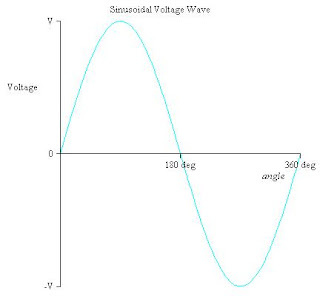 Here without doing much mathematics we will state that the voltage resulting in each winding is sinusoidal. Naturally these three voltage waves will be displaced by 120 degree. This gives rise to the balanced three phase system. The diagram of the voltage induced in the three phases is shown in the figure below. Considering an impractical case, if the three stator windings will be centered at one place of the periphery of stator then the induced voltages in the three windings will not be displaced by 120 degree from each other. 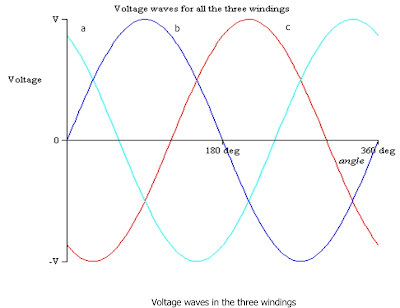 The three voltage waves will merge with each other, which is not desired. A complete one rotation of the rotor(so the magnetic field) gives one complete cycle of the voltage wave in a winding of stator. The N complete rotation will give rise to N complete cycles of voltage waves . If rotor completes N complete rotation in one minute, then N cycles of voltage waves will be produced in one minute. then in one second N/60 complete voltage cycles will be obtained. The above calculation is true only for 2 pole(one North plus one South pole) machines. For machines with more poles the windings will come under the North pole - then South pole - then North pole - again South pole.---- etc more frequently. For example in the salient 4-pole machine shown above, for one complete rotation of rotor, each winding faces two North poles and two South poles. hence if P is the number of poles in the rotor of the machine. then the above figure will be multiplied by P/2 (P is divided by 2 as two poles give one complete voltage cycle). This 'f' is called the frequency of the voltage wave, (also obviously the frequency of current wave). This 'f 'or frequency of generator is the frequency of the power system. This frequency (f) is the single greatest important parameter of power system that clearly indicates the health of the system. Different countries/power systems has standardized frequency for their systems. Usually 50 Hertz (Hz) or 60 Hertz is used in most of the countries. Clearly where 50 Hz is the standard frequency, for 2-pole machine, the speed of the machine should be 3000 rotations per minute( RPM), and for 4-pole machine, the speed of the machine should be 1500 rotations per minute( RPM). This is what exactly we discussed in the beginning of this section. In Hydro power stations due to slow speed machines, more number of poles are used to keep the frequency at 50 Hz. So in any power system, all the machines connected will obey this rule, that is to generate power and keep the frequency at the standard 50 Hz if it is a 50 Hz system or 60 Hz if it is 60 Hz system. The frequency does not vary from point to point within the system. This is also called as the synchronous speed. Thank you for this post... I struggled to understand the derivation of f = N * P / 120. Your explanation made it clear to me. A sincere thank you.